Model Name: Cosmograph Daytona "Jumbo Logo"
This reference 6239 most notably features subsidiary registers that have aged to a particularly even and stunning tobacco brown tone. Contrasting against the bold and unblemished white graphics, the effect is remarkable. It was previously sold at the groundbreaking thematic sale "Rolex Daytona "Lesson One" 50 exceptional examples of the world's most celebrated chronograph wristwatch". Carrying a 1.4 million serial number, the present watch is an early example of reference 6239. During the beginning of the model's production, Rolex experimented with various dial configurations in order to realize its design blueprint for the Cosmograph Daytona. 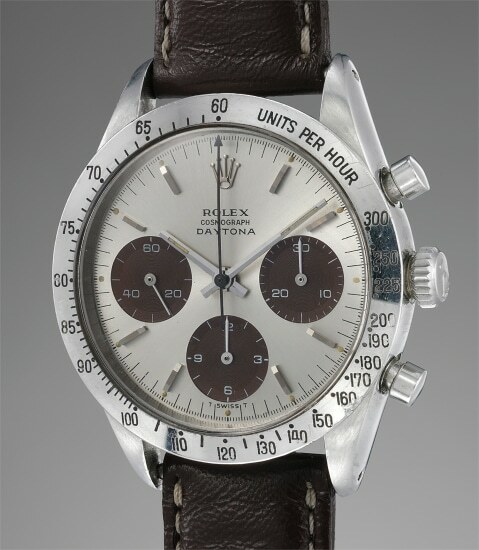 While earlier reference 6239s featured a small Daytona script below "Rolex Cosmograph", Rolex also introduced a different dial configuration displaying a slightly larger "Daytona" font below the “Cosmograph” inscription. These early dials represent Rolex's ingenuity and willingness to experiment with design composition. It was only much later that Rolex definitively printed the "Daytona" designation above the subsidiary register positioned at 6 o'clock. Apart from these details, the case is also offered in crisp condition. The bezel, calibrated to 300 units, is correct for early examples. Furthermore, the movement bridge is stamped ROW, indicating this watch was made to be exported to the United States of America.